The danger of newspapers turning into commodities and brands, the threat to the primacy of the editor and the “inhibiting impact” of contempt of court and defamations against the media were the focus of a two-day national colloquium on ‘Emerging Media Issues’ held here at the weekend under the auspices of the Media Development Foundation. The prestigious North-South Corridor project to be launched from Srinagar is likely to be inaugurated by Prime Minister Atal Behari Vajpayee during his visit to Jammu and Kashmir from April 18. Casualties resulting from blockages in arteries of brain, kidneys and legs are on the rise in India, but the disease is not paid as much attention as it merits till it causes severe complications. At least five persons were injured when the police resorted to a lathi charge to quell mob violence in the Nagarwada area of the city last night. As Ms Uma Bharati renews her campaign against Mr Digvijay Singh, her brother, Swami Prasad Lodhi, himself a BJP MLA, will deliver religious discourses at Mr Singh’s hometown Raghogarh in Guna district. Uttar Pradesh Chief Minister Mayawati is all set to storm the silver screen albeit in a different way, with a film planned to be made on her. A Lucknow-based film company would soon be launching a film entitled “Maya Madam”, which would highlight the role played by Mayawati in the uplift of the Dalits and her courageous opposition to the prevailing caste system. In a sensational remark, former Jammu and Kashmir Chief Minister Farooq Abdullah has alleged that his National Conference (NC) party had been made to lose in the last Assembly elections to show its “credibility” but refused to specify who was behind it. 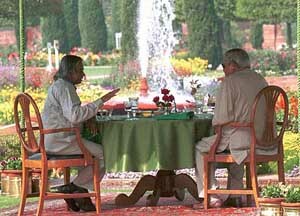 Prime Minister Atal Behari Vajpayee today had an hour-long breakfast meeting with President A.P.J. Abdul Kalam and is understood to have discussed the Iraq crisis among other issues of international and national interest with him. Himachal Pradesh Transport Minister G.S. Bali today met New Delhi Chief Minister Sheila Dikshit seeking an alternate parking slot for overnight halt of HRTC buses as the present parking area at Majnu-ka-Tila is being included in the Metro project. National award winner Ashwini Chaudhary is busy shooting for "Dhoop", based on the life of Kargil hero Anuj Nayyar. Renowned painter M. F. Hussain has painted a bat for cheering the Indian cricket team. There was no difference among the leading editors and journalists participating in the colloquium about the importance of commercial interests in running a newspaper, but the overwhelming view was that the profit motive should not overshadow the public and social purpose that a newspaper is expected to serve. There was total support to the call from senior Supreme Court advocate Rajeev Dhawan, for liberalising the law of contempt of court and scrapping the criminal defamation law so that the media could function without unreasonable restrictions. Mr T.N. Ninan, Editor, Business Standard, was equally forthright in his disapproval of any dominance of commercial interests. “Palming off advertisements in the guise of news is about the worst sin you can commit in a newspaper,” he said. Ms Shobna Bhartia, Vice-Chairman and Editorial Director, Hindustan Times, said there was nothing wrong as long as there was a clear demarcation between advertisements and news content in the main pages of a newspaper. The well-attended colloquium also provided an opportunity to the students of Asian College of Journalism in Chennai to hear the views of eminent media personalities discuss among other issues, the ethics of news as business, marketing versus editorial, the challenge of Mardochism and tabloidisation and dumbing down and identity crisis in the media. Mr N.Ram, Editor, Frontline, Mr Sashi Kumar, Chairman, Media Development Foundation, Mr Lawrence Pinkham, Dean, Asian College of Journalism, Pro C.P. Chandrasekhar of Jawaharlal Nehru University, and Mr Sadanand Menon, journalist and cultural critics, chaired the various panels in which the participants included Mr Praful Bidwai, Mr Philip Mathew, Ms Malini Parthasarathy, Executive Editor of The Hindu, Ms Sucheta Dalal, columnist, and Mr Tarun Tejpal, and Mr Rudrangshu Mukherjee, Editorial Writer, The Telegraph. Mr Cho Ramaswamy, MP, said it was high time the Supreme Court set guidelines on what constituted contempt of court and how it should be dealt with. But in his view, the media that published slanderous articles with utter irresponsibility should not be allowed to go scot free and must face the consequences. Mr N.Ram, Mr T.J.S. George, Mr Syed Naqvi, Mr Vikram Chandra, and Mr Sashi Kumar, among others, deplored the “tabloidisation and dumbing down” of newspaper content by a section of the media. Mr Vinod Mehta, Editor-in-Chief of Outlook magazine, said unless editors recognised the commercial aspect of the newspaper, they would become “extinct species”, and proprietors would start depending on “brand managers” to make the publications economically viable. Mr N.Murali, joint Managing Director of The Hindu, called for a proper balance between marketing and editorial. Mr Shekar Gupta, Chief Editor, Indian Express, said there was no contradiction between good journalism and the marketplace, but news content should not be taken over by advertisers. Mr Ravi Dhariwal, Executive Editor, Bennet Coleman and Co., maintained his newspaper did not seek to compromise on editorial content, but only worked out innovative methods of marketing. The Prime Minister would be visiting the trouble-torn state of Jammu and Kashmir for the first time after the state Assembly elections held recently. He would also review all projects undertaken as part of the economic package announced by him last year. According to official sources here the Prime Minister will perform “bhoomi pujan” to mark the inauguration of the North-South Corridor project which is also said to be his dream project. Mr Vajpayee will also chair a Unified Command meeting, which will take stock of the security situation in the restive state, especially at the Line of Control and the International Border along Pakistan. The Prime Minister had earlier chaired the Unified Command meeting during his May 2002 visit to the state. Mr Vajpayee will also review the progress of the development projects carried out under the Rs 6,165-crore economic package to be spread over 20 years. The Prime Minister will also assess the financial condition of the state, which the Mufti Mohammed Sayeed-led coalition government described as “weak” and the reason for presenting a Vote-on-Account and not a full-fledged Budget in the Assembly this year. The 7,300-km North-South-East-West Corridor was launched by Mr Vajpayee in January 1999. The programme was proposed to be completed in different phases in a span of seven years and the six-lane project is estimated to cost Rs 28,000 crore. The 4,000-km North-South Corridor from Kashmir to Kanyakumari will pass through the Srinagar-Mathura-Agra-Gwalior-Jhansi-Nagpur-Hyderabad-Bangalore-Hosur Salem- Kanyakumari route. The 3,300-km East-West Corridor (from Silchar to Saurashtra, including Salem-Cochin spur) will pass through Silchar-Guwahati-Siliguri-Purnia-Muzaffarpur-Rajkot-Porbandar route. These blockages can result in strokes, uncontrolled blood pressure, heart failure and kidney failure, severe leg pain while walking and gangrene, said experts here participating in the first meet of the Endovascular Intervention Society of India. About 200 super specialists in the area of Endovascular Intervention, including the world’s top three, participated in the two-day conference which ended here today. They are Dr Elio Piccinini, Professor of vascular surgery from Italy, Dr Klaus Mathias, interventional radiologist from Germany, Dr Krisna Rocha Singh, interventional cardiologist from the USA. Addressing the meeting, Dr Ashok Seth, Chief of invasive and interventional cardiology, Escorts Heart Institute and Secretary of the society, said every year about 17 lakh cases of strokes resulting from blockages are reported and in five lakh cases, the patient dies. He said nearly 10 per cent of the patients with heart disease had blockages of arteries going to brain and 10 to 15 per cent could have blockages in kidney arteries. The incidence of blockages was on the rise in Indians, but there was poor knowledge about its recognition and treatment. Dr Seth said endovascular intervention was basically the non-surgical treatment of blockages in arteries of brain, kidney and legs, and interventional radiology, vascular surgery and interventional cardiology were its three different branches. He said there were a lot of similarities in all three methods and the idea of the scientific meeting was to unify these approaches. Addressing the meeting, Delhi Chief Minister Sheila Dikshit hailed the formation of the society and called up on the country’s medical scientists to keep pace with the mind-boggling advances that had been made in the field of medicine. Some groups hurled several ‘sutlis’ and crude bombs and indulged in heavy stone-pelting for more than half-an-hour, creating panic amongst the residents of the area under the Karelibaug police station of the walled city, the police said today. The irate mob set ablaze a Maruti car, a two-wheeler and damaged several other vehicles before dispersing following police intervention which left five injured, they said. The programme has been chalked out by the Raghogarh municipality chairman, Mr Narendra Lahoti, a protégé of the Chief Minister. According to the programme, Mr Lodhi will reach Raghogarh on April 2 and stay there till April 11, giving sermons in the evenings. The programme will be formally inaugurated on April 3. Uttar Pradesh Chief Minister Mayawati is all set to storm the silver screen albeit in a different way, with a film planned to be made on her. A Lucknow-based film company would soon be launching a film entitled “Maya Madam”, which would highlight the role played by Mayawati in the uplift of the Dalits and her courageous opposition to the prevailing caste system. It will be a big budget film and artistes from Bollywood will be roped in to make it commercially viable, producer of the film Harish Kumar said here. Refusing to divulge the star cast, Kumar said the film would be directed by Shashi Kant Mehta, who had directed the Anil Kapur-Manisha Koirala starrer “Ek Choti Si Love Story”. When asked as to who would play the role of Mayawati, he said that the selection of the heroine would be made on the basis of an all-India talent competition. The film would not be an art movie, he said, expressing confidence that it would be big success. The multi-star cast of the film will ensure that it earns handsome profit, Kumar said. The Rajya Sabha member also attacked Chief Election Commissioner J.M. Lyngdoh for alleging that his government had tried to “rig” the poll and said, “had I wanted I would have done it”. Had the NC won “it would have been treated as rigged elections,” he said participating in Karan Thapar’s ‘Court Martial’ programme to be telecast on SAB TV on Thursday. 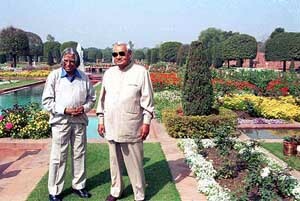 President Kalam with Prime Minister Vajpayee at the Mughal Garden on Sunday. Although the meeting was described as a courtesy call by the Rashtrapati Bhavan spokesperson, reports suggested that at the meeting the all important prevailing situation in Iraq and India’s stand on it was discussed. The spokesperson said that the Prime Minister had discussions with the President over breakfast at the famous Mughal Gardens. “The meeting lasted over an hour”, he added. According to an official spokesman, the Delhi Government has assured the minister to provide an alternate parking area for the state roadways buses. Nearly 60 HRTC buses halt at Delhi for the night. The minister also called on senior Congress leaders during his stay in the Capital.